An abandoned car lies in the mud off a road destroyed by flood waters along the South Platte River east of Greeley, Colo, Tuesday. As attention turns to the aftermath of Colorado’s record floods, people have been warned to stay out of the lingering water because it may contain harmful chemicals and sewage, officials said. Emergency airlifts waned Wednesday as the number of people still unaccounted for continued to decrease, although crews were stepping up efforts to find the hundreds of people still missing. This left rescue crews to assess the ruined homes, roads and bridges which littered the 17 counties hit by the extreme weather. Emergency officials said some residents in Boulder County — where about 1,800 residents had to be evacuated due to the catastrophic flooding — will receive temporary passes to see their homes as early as Thursday. Among officials’ chief concerns is the possibility that harmful pollution has been unleashed into the floodwater, especially in the oil and gas drilling center of Weld County. Search teams in northern Colorado are still working hard as floodwaters continue to ravage the area. 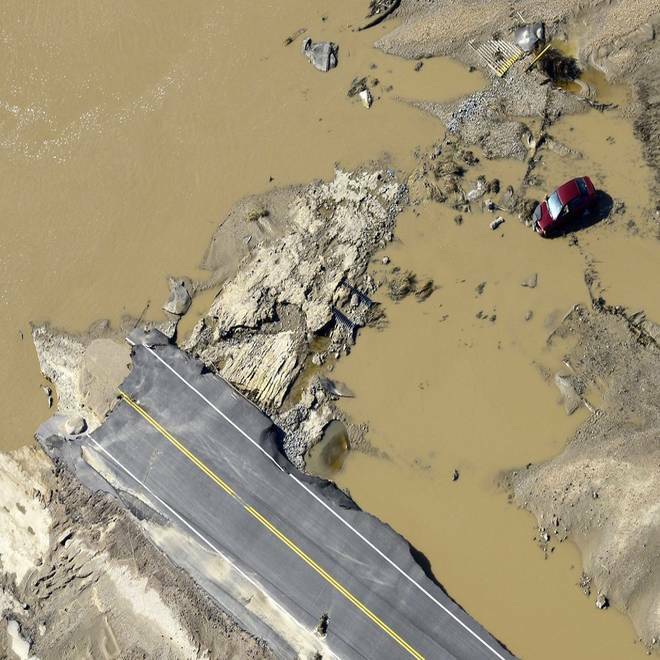 Washed-out roads and collapsed bridges are adding up, and according to transportation officials, they could take years to rebuild. “Many contaminants, such as raw sewage, as well as potential releases of chemicals from homes, businesses and industry, may be contained in the floodwaters," Mark Salley, spokesman for the Colorado Department of Public Health and Environment, told the Colorado Springs Gazette. Canadian energy firm Encana Corp has been forced to shut 99 of its 1,200 wells in the state. It is one of several companies which has begun inspections to repair and limit the effects of the storm, a spokesman said in an email to Reuters. “We still have not found any spills of any reportable quantity, but cannot rule out future discoveries until we get to everything,” said spokesman Doug Hock in the email. Young Gas Storage Co, in Morgan County, and Colorado Interstate Gas (CIG) both declared force majeures due to exposures of natural gas lines, Reuters said. CIG said on its website that the lines were exposed due to erosion and scouring caused by heavy flooding in the area, but that there were no reports of damage to line itself. “At this point, as access continues to be limited and emergency responders remain focused on lives, property and roadways, we have limited information about specific impacts or particular locations," spokesman for the Colorado Oil and Gas Conservation Commission (COGCC) Todd Hartman told the Colorado Springs Gazette. As life slowly gets back to normal in the areas hit by massive flooding in Colorado, the Boland children are still holding out hope for their missing father after he left home in the flood to find his wife. NBC's Kate Snow reports. Later Wednesday, COGCC announced it received a report of a damaged oil tank that has released an estimated 125 barrels (5,250 gallons) into the South Platte River. "The COGCC responded this afternoon and will, along with the Colorado Department of Public Health and Environment, continue to monitor the cleanup work," a statement read. 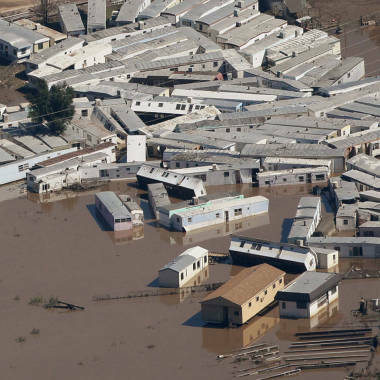 Activists have uploaded photographs onto various websites of flooded oil and gas wells, chemical storage facilities and waste water and chemical holding tanks, the newspaper said. Gary Wockner, of Denver-based Clean Water Action, told the newspaper: "The [health department] and [oil and gas commission] should inspect every well that was flooded, require that the industry clean up every pollution plume, and create new regulations that better protect the public and the environment in and near floodplains." The number of people missing in the state has dropped from 1,200 early Monday to around 300 on Wednesday, the Associated Press said, citing officials. However officials told the Associated Press they expected the death toll to increase, forecasting a search operation which could last months. When those residents allowed back into their homes arrive they will see tags and flags from rescue crews indicating whether their residence had been searched. The sheriff of hard-hit Boulder County, Joe Pelle, told NBC station KUSA on Wednesday that rescue workers were finished with their "high octane" search-and-rescue operations, but that crews would continue to go through debris piles and vehicles looking for victims in the flood-damaged mountain foothills. Lt. Mitch Utterback with the National Guard told the Boulder Daily Camera newspaper that he expected fewer rescues on Wednesday as most stranded residents had been airlifted out or have decided to stay put. "Most people are where they want to be right now," Utterback said. As numerous roads remained washed out, a National Guard helicopter was able to successfully evacuated at least two people by air on Wednesday. A Disaster Assistance Center opened on Wednesday in Loveland in Larimer County, another area inundated by flooding, where more than 1,000 trapped people had to be rescued. Officials have also begun estimating repair costs. "It's going to be astronomical, there's no way around it," Capt. Ralph Kettle with the Poudre Fire Authority in Ft. Collins told the Associated Press. Dale Miller, road and bridge director for Larimer County, said it could compare to the damage wrought by a 1976 flood that killed 144 people. It took two years to rebuild after that disaster. It is not yet known how much federal aid will result from President Barack Obama's disaster declaration. But an initial pledge of $5 million is expected to be dwarfed by the final figure needed to repair the damage. Jeff Black of NBC News as well as Reuters and the Associated Press contributed to this report.